The Bagua used in Chinese divination, called the post-celestial pakua, is a system of trigrams (stacks of three solid and/or broken lines) designed by King Wen almost three thousand years ago to describe the nature of changes in the universe. Notice that this pa-k’ua doubles as an eight-point compass, with each direction associated with a particular trigram. The solid lines in the trigrams symbolize yang and the broken lines symbolize yin. Thus, a trigram with two or more broken lines is primarily yin, whereas a trigram with two or more solid lines is primarily yang. Yin-type trigrams are associated with receptive energy and stillness, while yang-type trigrams are associated with expansive energy and action. A fundamental assumption of Chinese divination is that if we know how things change over time, we can predict future events. This is why the trigrams and their patterns of change form the foundation of the I-Ching, the book of divination. The patterns of changes represented in the post-celestial pa-k’ua can tell a feng-shui practitioner about the type of energy, destructive or nourishing, that “enters” a particular position of a building (north, south, east, west, etc.) at a particular time. For example, look at the grid of the Flying Stars System. You will notice that the number 9 appears in several squares. Number 9 is the numeric symbolizing fire. In our example, number 9 appears in the sections representing the study, the bathroom, and the atrium. This means that there will be a risk of fire in these rooms. The bathroom has the least threat because of the presence of water. The atrium has the biggest threat because plants (and therefore wood) can strengthen the element of fire. A Ming Gua is an element and Trigram that is assigned to one and each individual person. From a Trigram good and bad directions for a person are determined. The eight house Fengshui school is also determining good and bad areas of a house this way. When calculating the life number (Ming Gua) you have to be aware that the years are given are according to the solar calendar. The beginning of a year is usually the 4th or 5th February. The eight Min Gua have different good and bad directions. 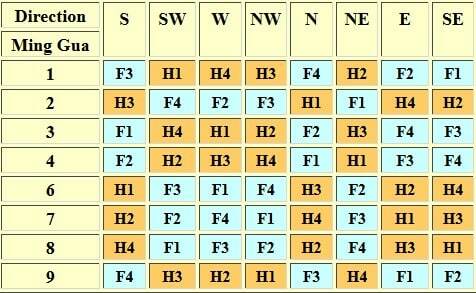 In the table, the good directions are shown as F1 up to F4, and the bad directions as H1 up to H4. The naming is in accordance to Master Joseph Yu. Fortunate directions are marked F1 up to F4, where F1 is the best direction. Harmful directions are marked H1 up to H4, where H1 is the worst direction. From this we can divide all people into two main groups. East group people have Ming Gua 1, 3, 4 and 9. West group people have Ming Gua 2, 6, 7 and 8. F4 = FU WEI (Stability); Is constant and brings good luck in general. H1 = HOO HAI (Life threatening); Brings excessive bad luck. H2 = WU KWEI (Fife ghost); Brings sickness, theft and fire. H3 = LUI SHA (Six demon); Brings lawsuits and conflicts. H4 = CHUEH MING (Mishaps); Brings quarrels and arguments. Xuan Kong pronounced Schuan Kong, is the most Authentic and Traditional School of Feng Shui. It is also known as the Time and Space School. Fei Xing means the Flying stars and this school is based on Environment, People and Time. It deals with space we occupy and reveals to us in details Heaven’s secrets. These are given to us by the Heaven Chart, the Earth Chart and the Mountain and Water dragons. Each house is unique in its own way, so there is no particular area allocated to Wealth, Health etc, but each area is derived from mathematical and logical calculations. Where and how to place a particular ‘cure’ and for how long, is what an experienced practitioner will advise a client. The results can be quite dramatic, especially if the Heaven Luck of a person is strong. Reasonable amounts of improvement have been noticed even otherwise, resulting in the best possible benefits, to an individual, or people living in the house. Using the flying stars, one can determine the present or future prosperity of a home or commercial premises. By the same method, a qualified practitioner will ascertain, where to have the reception, which area in the office space is to be given to the head of the family/organization, where to place the Managerial staff/ Accountants/ P.R.O./ Sales and Marketing staff etc. thereby maximizing the potential of a premise, so that there is no decline in Business turnover. Moreover, happy employees means enhanced productivity levels.